The Leader in Jet Lag Management for over 25 years. Jet lag is the curse of modern jet travel, but it doesn't have to spoil your trip. 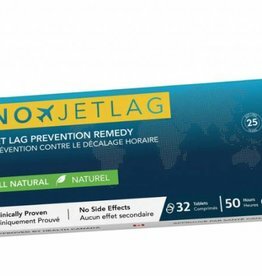 The unique homeopathic remedy No-Jet-Lag helps ensure holiday enjoyment and working efficiency even after long airline flights. No-Jet-Lag is raved about by satisfied travellers globally, including business executives, sports teams, tour operators, and flight crews. It is safe, easy to take, and proven effective in tests.